Mikrotik Wireless AP Client – Kattieh Dynasty Ent. 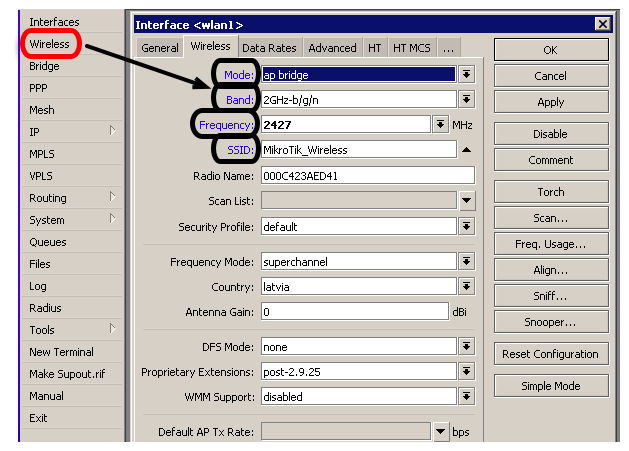 Configuration example shows how to establish simple wireless network by using MikroTik RouterOS. MikroTik RouterOS is fully compliant with IEEE802.11a/b/g/n standards, MikroTik RouterOS device can be used as wireless access-point and wireless station (other modes are supported too). These settings are enough to establish wireless connection, additionally you need to add IP address for the wireless interface for IP routing, optionally add security and other settings. Wireless client configuration example is for MikroTik RouterOS, other vendor OS configuration should be looked in the appropriate documentation/forum/mailing list etc. 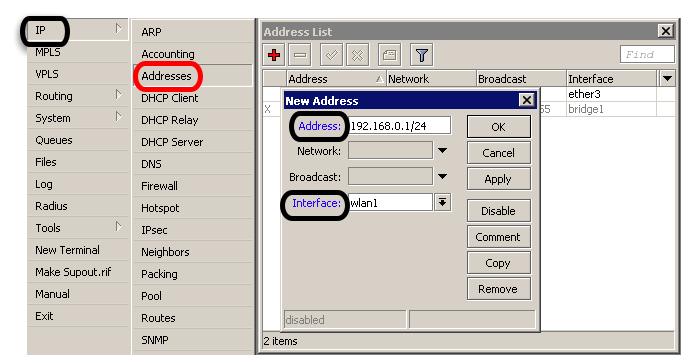 Connect to the client router via the same way and proceed to the Wireless interface configuration. These settings are enough to establish wireless connection, additionally you need to set IP address for the wireless interface to establish IP routing communication with access point, optionally use security and other settings. All the necessary settings for the simple Access Point are showed here. Security profiles are used for WPA/WPA2 protection, configuration options are explained here. Usually all wireless clients share the same security configuration as access point. mode=ap-bridge allows 2007 clients, max-station-count is used to limit the number of wireless client per Access Point. 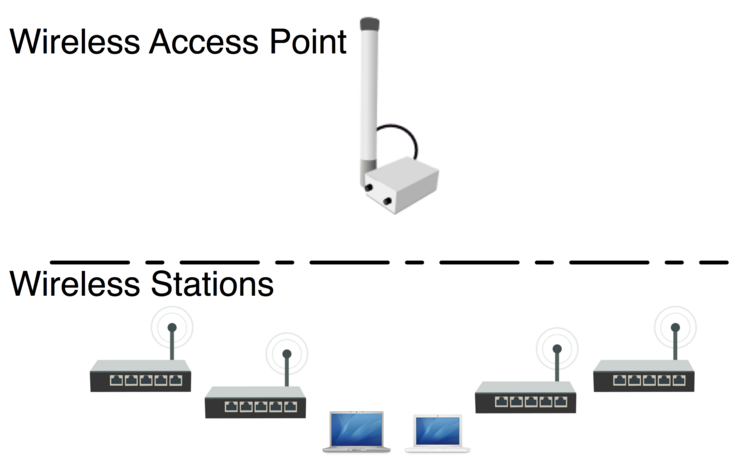 Wireless mode=bridge is used for point-to-point wireless links and allows connection for one station only. Station adapts to wireless access point frequency, despite of the frequency configuration in Wireless menu. 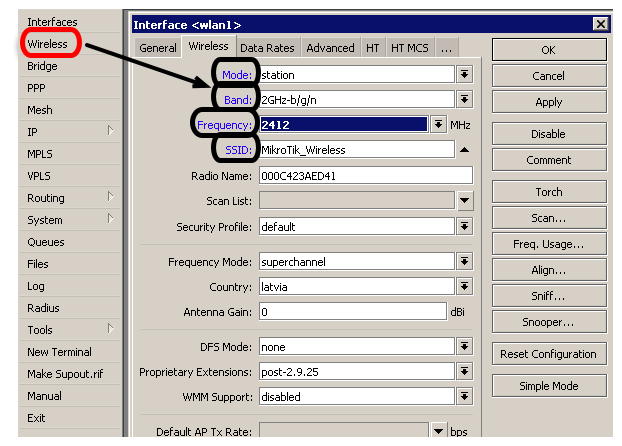 Station uses scan-list to select available Access Point, when superchannel mode is used on wireless Access Point, set custom Access Point frequency to mode=station scan-list.